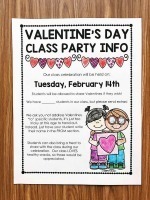 Are you planning a party for Valentine’s Day in your class? Here is a Free Valentine’s Day Letter to send home with your students to plan your perfect celebration. This file is completely editable, so when you open it with Adobe Pro you will be able to change all fo the text. We give you two options for letters: Valentine’s Day or Friendship Day. And then from there we give you two more options. Option one is listing the students’ names so the kids can fill out the valentines and option two is just asking students to fill out the from section. Option two is my suggestion from our Tips for a Stress-Free Valentine’s Day Class Party. Click here to read more about that. Let us send you this letter right to your inbox. I am having trouble signing up to receive this awesome note. Is there any way you could send it another way please? Thanks for the useful Valentine’s letter. Do you also have a parent letter requesting party goodies to be sent in? I always have the problem you describe in that too many of one thing comes in. I’d love to try your suggestion but I don’t know how to work the parent letter. Can you help? Thanks so much! Thanks so much for stopping by. Unfortunately, we don’t. If we add anything to this file though I will make sure we include this! It’s editable so you can always edit it to say exactly what you want. =) Maybe that will work for you for the time being.